Get Shorty is a 1995 American crime comedy film based on Elmore Leonard's novel of the same name. Directed by Barry Sonnenfeld and starring John Travolta, Gene Hackman, Rene Russo, and Danny DeVito. A sequel, titled Be Cool, was released in 2005. Chili Palmer (John Travolta) is a loan shark based in Miami who clashes with mobster Ray "Bones" Barboni (Dennis Farina) over a leather jacket that "Bones" borrowed from Palmer without permission. They have two brief but violent confrontations, the first of which leaves Barboni with a broken nose and the second singes his scalp from a bullet from Chili's gun. Palmer's long-time mob boss Momo dies of a heart attack, and Palmer suddenly finds himself working for Barboni, whose first order is for Palmer to collect a loan debt owed by Leo Devoe (David Paymer). Palmer believed that Devoe was killed in a commercial airliner crash, but he had actually gotten off the plane and failed to re-board. After the plane crash, Devoe's wife Fay identifies his personal effects, and the airline offers her a check for $300,000. Chili visits her and discovers that Leo is still alive, partying and gambling in Las Vegas with the insurance settlement money. While in Vegas looking for DeVoe, Palmer picks up a second job from a casino manager to collect a debt from Hollywood B-movie producer Harry Zimm. Palmer goes to Los Angeles and locates Zimm (Gene Hackman) at the home of B movie actress Karen Flores (Rene Russo), and he warns Zimm to pay the money that he owes in 90 days. Palmer then pitches a movie script idea which is a thinly veiled story of his own life, including the scam by Leo. Zimm is interested, but he has both financial debt and a script called "Mr Lovejoy" that he doesn't wish to share. He owes $200,000 to limo service owner drug dealer Bo Catlett (Delroy Lindo) for investment in a picture that never got made. The script is, according to Zimm, "My Driving Miss Daisy." Catlett himself owes even more money to a foreign drug cartel led by Mr. Escobar (Miguel Sandoval). Catlett also wants to be in the movie business for the fame and fortune, but not for any artistic pretensions. Palmer says that he will help Zimm take care of solving the debt issue with Catlett. Palmer gets a tip and tracks down Leo Devoe in his hotel room and collects the money owed, plus the "vig" owed for late payment, leaving Devoe the remainder of the insurance money to gamble with. Palmer then returns to Karen's house, where he asks Karen on a date. She is the ex-wife of famed actor Martin Weir (Danny DeVito), which gives Palmer the idea that Weir should star in his movie. He and Karen go to Weir's home to pitch the story idea. After pitching the movie, Palmer gives the actor tips on how to act like a loan shark. Palmer is waiting for Catlett, who comes to Zimm's office for a progress report about the film he is supposedly financing. Chili tells Catlett that Zimm has a different project he needs to finish first and that Catlett can wait in line. Catlett and his sidekick Ronnie (Jon Gries) proceed to threaten Zimm, saying they want their money back, and to get rid of Palmer or else. Zimm, trying to regain the upper hand in the situation, makes a call to Barboni in Miami, telling him Chili has recovered the money from Leo Devoe and speaking to him rudely on the phone. Barboni promptly flies to Los Angeles, confronts Zimm in his office, and beats him mercilessly when Zimm does not reveal the location of Chili and the money. Ronnie walks in and Barboni shoots him, then puts the gun in Zimm's hand. Doris (Bette Midler), Zimm's girlfriend, whose late husband wrote Mr. Lovejoy, calls Karen and tells her that Zimm is in the hospital. When he is eventually released, Zimm must wear a neck brace and remains in agonizing pain, even as he endures Weir's arrogant behavior in a brief lunch meeting with Chili and Karen about their movie project. At another restaurant, Zimm claims he doesn't need Chili's money anymore. Catlett's bodyguard, Bear (James Gandolfini), a movie stuntman on the side, is thrown down a flight of stairs by Chili. Desperate for money to pay Mr Escobar, Catlett kidnaps Karen and demands the money that Chili has gotten back from Devoe. But after Chili gives him the money, Catlett reneges on their deal. Unbeknownst to Catlett, Chili has already made a deal with Bear to double-cross Catlett. On a balcony at Catlett's home, where Karen is being held, Bear pretends to give Chili a beating, but it's a set-up. In the struggle, Catlett is pushed over a balcony rail that was previously loosened, falling to his death. At his hotel, Barboni confronts Palmer, demanding the money. He finds an airport locker key and assumes the money is hidden in the locker. At the airport, upon opening the locker, a shocked Barboni is confronted by DEA agents. On a Hollywood studio set, a film is being made. Harvey Keitel is playing Barboni and Martin Weir is playing Palmer. Penny Marshall is directing, with Zimm as executive producer, Chili and Karen as co-producers. Bear is a technical consultant. Chili and Karen are arguing with Weir's agent about Weir's appropriateness for another role. At the beginning of the film, Ray "Bones" Barboni has two thugs with him; one of them is played by private investigator Ernest "Chili" Palmer. Palmer was author Elmore Leonard's model for the character in the book. According to a newspaper article, he claims not to have been involved with gangsters or loan sharking. When the filmmakers found out from Leonard that there was a real "Chili" Palmer, they gave him a bit part in the film. The movie features an acid- and soul-jazz themed soundtrack with songs by Us3, Morphine, Booker T. & the M.G. 's, Greyboy and Medeski Martin & Wood alongside original compositions by John Lurie. The soundtrack was nominated for a Grammy Award (1997 - Best Instrumental Composition Written for a Motion Picture or for Television). On Rotten Tomatoes, the film received an 87% "Certified Fresh" rating, based on 52 reviews, with an average rating of 7.8/10. The site's critical consensus reads, "With a perfect cast and a sly twist on the usual Hollywood gangster dynamic, Get Shorty delivers a sharp satire that doubles as an entertaining comedy-thriller in its own right." On Metacritic, the film holds a score of 82 out of 100, based on 22 reviews, indicating "universal acclaim". The film was entered into the 46th Berlin International Film Festival. The film opened at #1 upon its release (10/20-22) with $12,700,007. Get Shorty remained #1 for three consecutive weeks before being overtaken by Ace Ventura: When Nature Calls. For his role as Chili Palmer, John Travolta received the Golden Globe Award for Best Actor – Motion Picture Musical or Comedy. The film also received nominations for the Golden Globe Award for Best Motion Picture – Musical or Comedy and Screen Actors Guild Award for Outstanding Performance by a Cast in a Motion Picture. ^ "Perry Moore, 'Narnia' series executive producer, dies at 39; Don Peterman, Oscar-nominated cinematographer, dies at 79; Nancy Carr, network TV publicist, dies at 50". Los Angeles Times. 2011-02-22. Retrieved 2011-02-23. ^ "Box Office/Business for Get Shorty". IMDB. Retrieved 5 November 2011. ^ "Get Shorty". Box Office Mojo. Retrieved 5 November 2011. ^ Anne E. Kornblut (November 5, 1995). "The Real Chili Palmer". New York Daily News. Retrieved 5 November 2011. ^ Okamoto, David (October 30, 1995). 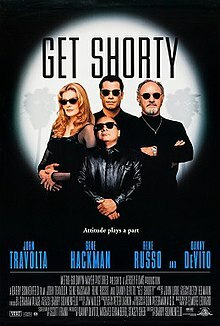 "`Get Shorty' Scores A Hit With Funky Soundtrack". Dallas Morning News. Retrieved June 14, 2017 – via Chicago Tribune. ^ "Artist: John Lurie". Grammy Award. Retrieved June 14, 2017. ^ Robert W. Welkos (24 October 1995). "Weekend Box Office : 'Shorty' Stands Tall in Ticket Sales". The Los Angeles Times. Retrieved 5 November 2011. ^ "Weekend Box Office November 10–12, 1995". Box Office Mojo. Retrieved 5 November 2011.